Discussion in 'Autograph Collecting' started by darthskellington, Aug 14, 2005. Another signing opportunity for everyone. This time, Amy Allen. Evryone knows Amy Allen as their favorite blue-skinned Twi-Lek Jedi, Aayla Secura. The character first appeared in the Star Wars comic book series by John Ostrander and Jan Duurseema. Lucas liked the appearace of the character enough to add it to AOTC at the last minute. She reappeared in ROTS. Her Jedi Master from the comics, Quin-Lan Vos, was also slated to appear in ROTS, but only appeared as a name reference. Amy first sported blue skin in the Episode I dvd, where she was inserted into Senator Orn Fee Taa’s senate box , in place of a human aide. While the SW movies are her only acting roles, Allen has done Visual Effects and production Assistant work on several movies now, including Pearl Harbor, , AI, AOTC, Gangs of New York, The Hunted, and Elektra. You can check out Amy’s IMDB filmography and short biography here. Amy does quite a few convention appearances these days. However, it is still possible to obtain an autograph through the mail. It appears that she will sign items you send, and will sometimes send out her own photos. Personalization is possible. Some people claim to have gotten Pre-Printed photos of the 2004 Disney SW weekends in response, so it is possible you might get an pre-print response. However, there are more instances of requesters getting real autographs through the mail. With that said, this is still an excellent opportunity to get a fan favorite autograph. Not to mention, a domestic one, for those in the US. Don’t forget to log when you sent your request. Post it here if you like. I sent an 8x10 about two weeks ago. I'll let you know when I recieve it. Welcome to the site Doom! Glad to see you're joining in. I hope these projects can help your collection grow. New poster, sent one to Amy after seeing the address on your site. Found out about you guys from Yodanews.com. Just got it back and it is amazing. Congrats, and welcome to the site. Welcome terman! Glad this section could be of help. I hope you try out some more addy's soon! I'm hoping to add a few more soon.....if work doenst' keep interfering. I'm definetly gonna try this one later on this week. I'll post my results. I wrote to her January 6th 2006 and still no reply. I'm not giving up hope yet. I have personal success with this same address. It took 161 days but was worth it. I met her in Dallas as well at the Comic-Con and thanked her for the reply and signing my pic. She was glad to hear that she returned it because she said that she gets behind from time to time when she gets busy but tries to reply to as many as she can. She was very nice so there's hope if you sent it to this address with a postage-paid return envelope. Yep, I did send it to that address. I also included a SASE. Ms. Allen is scheduled to be at the Dallas Comic Con FANDAYS event 3/17-3/18 in Richardson, Texas. Great in-person opportunity! I'm in total shock right now! 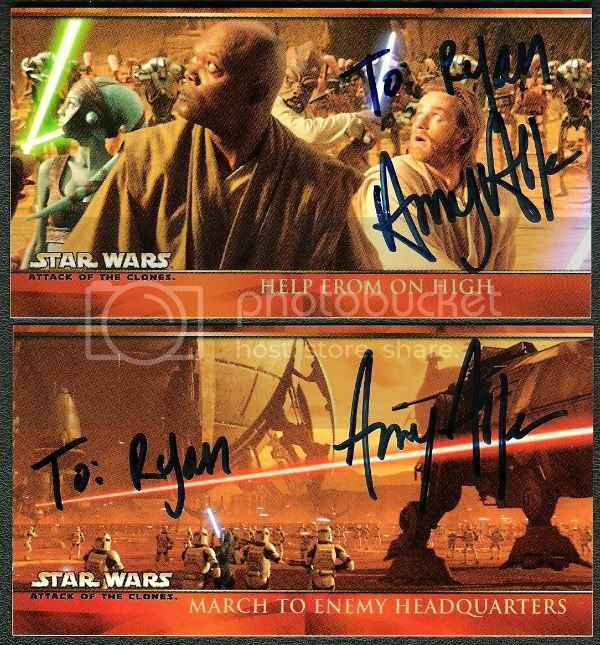 I just got a Success from Amy Allen (Jedi Master Aayla Secura)!! She personalized & signed both of my Topps AOTC Widevision cards #'s 55 & 59!! SASE was used. It took 360 days for a reply! I never thought I'd get these back. Thank You so much Amy! I used the P.O. Box 8081 address. I just checked how long ago I sent mine - 460 days, fingers crossed it was sent out with everyone elses and just taking a bit longer because Im in the Uk. I've got my fingers crossed for you too! I hope they arrive safely! I also got items back today.It took about 15 months.Thanks so much,Amy!! !